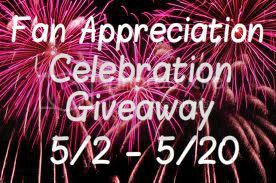 Parga's Junkyard has joined up with some of the best bloggers to celebrate our fans! It is because of you, our fans, that we keep plugging away! You give us the feedback we need to improve our sites along with the 'likes' to know we are doing it right! But, You have to Enter to win! sev yrs when all 3 of my kid were home.... its been sev since I have had that, and his my oldest didnt even call r nuthing so this yr I have been VERY depressed and rt....so I want to rem the la Mothers Day all my kids were home!! !